Today is the Winter Solstice the shortest day and longest night of the year and the official start of winter. With the shorter periods of light plants die or stop producing new growth. 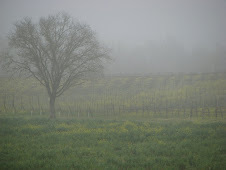 Average daily temperature below 43oF (6oC) will also cause plants to stop growth; so the leaves, stems, and flowers die. However, the roots of trees, shrubs and some plants are storing energy for spring growth. Tomorrow, days will start to lengthen; as nights shorten. After weeks of the Xmas frenzy I am ready to nest in my home and read the garden books I’ve been stockpiling all year, but haven’t taken the time to read. 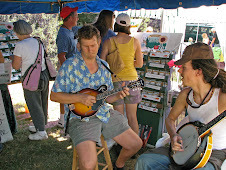 So while your garden is resting; envision your dream garden for 2008. A friend’s email greeting enclosed a video, which is especially appropriate for this time of year. A serious message presented in an entertaining format. Please click on www.storyofstuff.com ! Warm wishes for a peaceful, happy, and healthy Holiday and New Year! Many plants, shrubs and trees look dormant at this time; but, their roots are still growing. So until the ground freezes you should continue to water. Until early December continue to plant deciduous shrubs and trees. The holly trees, decorated with red berries, remind us of the approaching holidays. 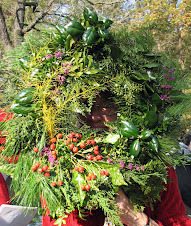 If you have only one holly tree and no berries; you need a mate – for your holly tree. Hollies are dioecious. The female holly tree bears the berries and the male tree provides the pollen. One male holly tree will serve many female holly trees. 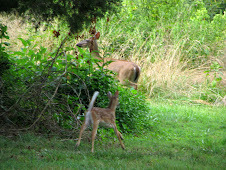 Deer will munch on young holly trees; if there is nothing better to eat. Ginkgo trees also are dioecious. The female ginkgo produces a smelly and messy fruit, which is a delicacy in China. The ginkgo has beautiful fan shaped leaves which turns a brilliant yellow after the other tree leaves have already fallen. 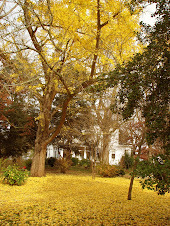 In my mother’s yard antique (over 100 feet tall) male & female ginkgos are the last trees to lose their leaves. Every year around Nov. 9th (my brother’s birthday) the falling brilliant yellow fan shape leaves signify the end of colorful autumn. This year the golden leaves are still clinging on. 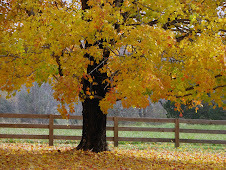 Over Thanksgiving the sugar maples were still in color. This is unusual and probably due to our warm and dry fall (global warming?). We have plenty of dead leaves, but only the oak leaves should be used for mulching your garden. Oak leaves are pest resistant and retain moisture. Magnolia and beech leaves should remain under the tree; since they create their own fertilizer. Throw the rest of your leaves on your compost pile. Are you considering a live Christmas tree this season? Then dig a large hole where you plan to plant your tree after the holidays. Fill the hole with your fallen leaves. 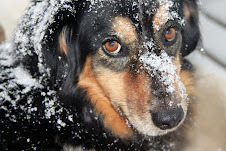 When the ground is frozen; you will be thankful you were prepared. Wisteria should only be fertilized after their leaves have fallen. This will give you more bloom and less growth next year. Fertilize your bulb beds. Continue to water newly planted bulbs. In order to discourage voles; do not mulch around your bulbs until the ground is frozen. Don’t sanitize your garden. Though some plants, such as Iris and peony, should be cut back and their dead leaves removed. Also roses should have their fallen leaves removed. 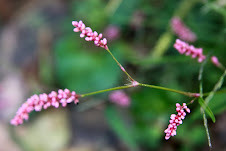 However, many perennials are attractive and useful in their dormant state. 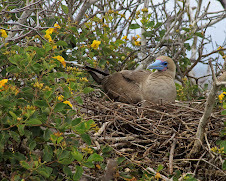 They provide food and protection for birds and protect new growth. Especially, your chrysanthemums or mums will start to look messy as the flowers fade and the leaves fall, but the old stems will protect new growth. The result will be healthier plants next fall. 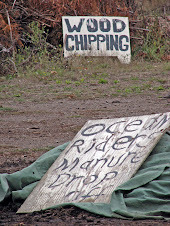 So leave some of your garden clean-up till spring. October is a good time to plant bulbs, both in your garden and in pots. If planting bulbs in clay soil you should work bone meal, top soil and hardwood mulch into the soil. Do not plant your daffodil bulbs until after the first hard frost. After the second hard frost, plant tulip bulbs. 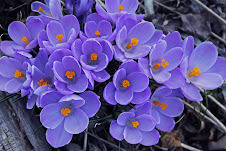 Follow with muscari and crocus bulbs. 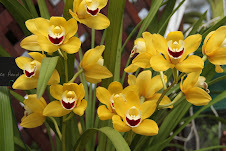 For indoor pleasure, force daffodil, tulip, crocus, and hyacinth bulbs. Place your potted bulbs in a dark and cool location until green life appears. 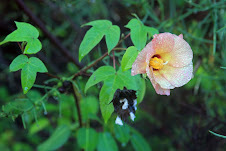 Then move to a sunny location where you can enjoy the blooms during the winter gloom. After blooming, let the bulbs dry; then store in a cool dark place. 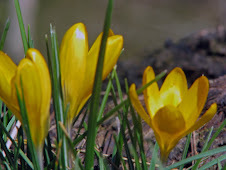 Plant these bulbs in your garden the following fall. Except for paper whites, which apparently do not re-bloom. Do you know how to get paper whites to re-bloom? October is the time to winterize your roses by applying potassium. Stop deadheading your roses so rose hips can form. The rose hips signal to the roses that this is the time to go dormant. Give the roses a final deep water then mulch to protect their soil from freezing. When the tree leaves start to show color begin to transplant and plant roses, shrubs and trees. 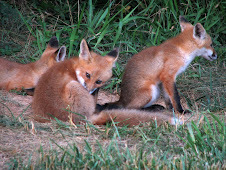 Last May I attended a travel writing conference in Arkansas. 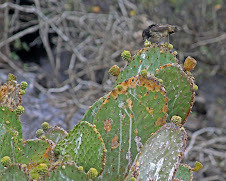 Many months later I found a misplaced memory card with my interview of Steven Foster on his new book, “Desk Reference to Nature’s Medicine” which is published by National Geographic. I had talked with him 12 years ago when I was harvesting ginkgo leaves for an herb company. Steven, who specializes in medicinal and aromatic plants, has become world renowned as an herbalist, lecturer, international consultant and botanical photographer. 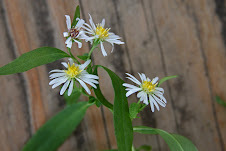 His website at http://www.stevenfoster.com/ is full of information on herbs and his international projects. 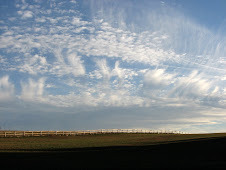 Today is Blog Action Day and this year bloggers are asked to write on the environment. A month ago I registered to participate. I was the 548,000 blog to sign in. At the moment I’m in my favorite place Marin County, CA. 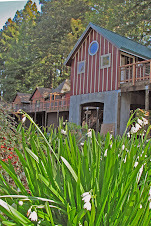 near Green Gulch Farm Zen Center. 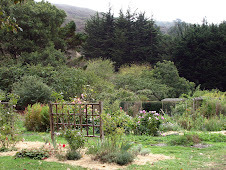 Only 20 minutes or more north of San Francisco this is a serene location in which to learn how to become a better environmentalist. The flower, fruit and vegetables gardens are brimming with beauty. On Tues. mornings one can volunteer to work in the garden. At 9 am last Tues. 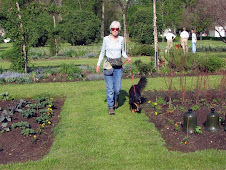 I met the head gardener, Astrid, and two other volunteers. Jessie is a high school student here for the morning as part of her independent study. Sarah volunteers often at the Center. 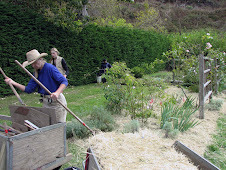 Our first activity was to spread straw mulch on a freshly weeded flower bed. We carefully placed straw (about two inches thick cover) around the flowers covering the bare ground. 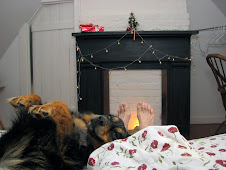 We used boards which we laid down on the beds to reach the center of the beds. This was to distribute our weight so as not to compact the soil. We compressed the straw with our hands to push out the air; so a strong breeze wouldn’t blow our work away. Next we were directed to an area of the bed which needed to be weeded. Weeding is my favorite garden activity. I chose a large patch of scented Bloody Cranesbill Geraniums. 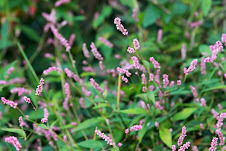 Easy to zone out on the thick perfume, red tinted leaves, and blue flowers of this plant. 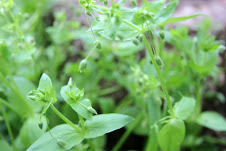 ( I took a seed pod to germinate at home.) We used a knife-like tool to get deep at the roots of tall grasses which were popping up through the geraniums. 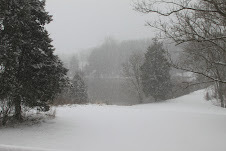 Around 10:30 we headed into the dining room for a mid-morn snack of fresh bread, muffins, fruit, tea and coffee. Rather than returning directly to the gardens we help peel and chop quinces which will be made into a paste. After an hour we returned to the gardens to deposit our weeds on the correct compost piles (we used white buckets for compostable weeds and black for invasive) and to return our gardening tools and wheel barrels to the garden shed. Then we joined the rest of the members of the Center for a delicious lunch. The breads freshly baked in the kitchen, large salad of argula, flowers, and melon from the garden, four different soups (a thick puree of spinach and chard topped with fresh cheese shaving; tomato & lime; miso; and beet). 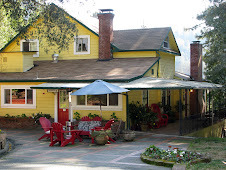 For directions and more info on Green Gulch Farm Zen Center see website at http://www.sfzc.org or call 415-383-3134. The nature images in her poems often soften her themes of feminism and discrimination. As her garden was a respite from the harshness of life. “Most things are colorful things- -the sky, earth, and sea. Black men are most men; the white are free!... “ excerpt from her poem "White Things"
This fall a collection of her letters and poem drafts will hopefully become part of the archives of the University of Virginia’s Special Collections Library. 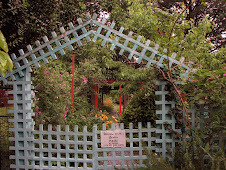 In 2005 a PBS GardenStory series presented a segment “Garden as Muse” on Anne Spencer. Thanks to volunteers, such as the Hillside Garden Club, Lynchburg college students, and individuals, her garden and home remain open to the public. Several other historical buildings line the block where she lived. Her garden, always open to the public, is located behind her home at 1313 Pierce Street close to Route 29. 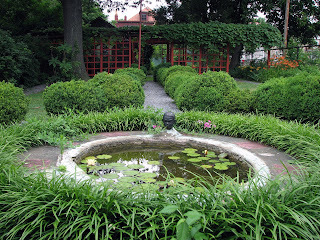 Call Sandra Wilson (434-384-3963) for a guided tour of the Anne Spencer House & Garden Museum. Still no rain, but a few tears! 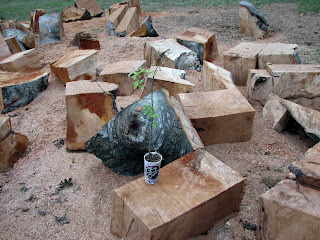 My mother had a heritage copper beech slaughtered. Trees have always been a special friend. My sister and I called this beech "the elephant tree". As a child I spent many hours prone on the enormous gray branch, hidden by the reddish leaves. All that is left is a seedling, which I will nourish. September is the time to start planning and working on your spring garden. If you haven’t already noticed; the garden catalogues, garden shops and even hardware stores are selling a variety of spring bulbs and perennials. Prolific use of deer proof daffodils is always a guarantee for a joyful early spring. This has been a wonderful summer for crepe myrtles and to prolong the white, pink and purple blooms remove the faded blooms. 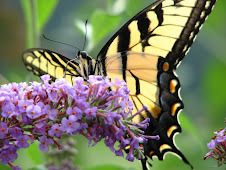 Removing the dead blooms on butterfly bushes will also stimulate new blooms. 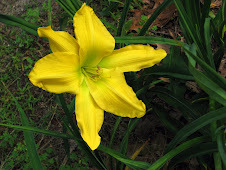 Continue to cut the faded blooms of lilies, but do not cut the stems and foliage until they have turned yellow. When your peony foliage and stems turn brown; cut and destroy the stems and leaves to protect spring growth from diseases. Now is the time to divide and plant peonies. Dig holes 2ft deep and 2ft wide and fill with compost and bone meal. Let soil settle a week or so then plant the peonies with their roots about 11/2 inches below the soil surface. Use wood ash from your fireplace, wood stove, or burn pile to fertilize peonies and lilacs. September is the best month to work on your lawn. 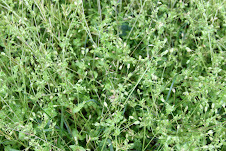 My method is to let the clover spread and to encourage patches of mosses. However, I realize most still strive for the perfect “lawn”. So reseed, fertilize and remove weeds. 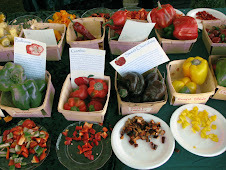 We may have moderate weather for several months so there is still time for your fall vegetable garden. Cool weather vegetables such as lettuce, spinach, herbs etc. Plant a few in containers. Before our first frost, take the containers inside to sunny spot and enjoy fresh vegetables and herbs all winter. Water newly planted seeds, vegetables, shrubs and trees often. If dry; water established plants well no more than once or twice a month to encourage deep roots. As always attack your weeds before they can reseed! Yesterday I had an enjoyable and educational day at the 1st Heritage Harvest Festival at the headquarters of Monticello’s Center for Historic Plants near Charlottesville, VA. Taste tested at least 30 different tomatoes and several tofu dishes, bought heritage red bell pepper seeds, attended lectures and received free Botswana Blackeye seeds. 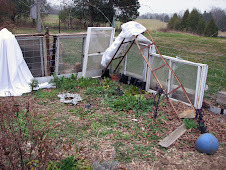 I learned how to grow beneficial plants which support beneficial insects and lure bad insects thereby protecting my garden, how to maintain a winter vegetable garden, with spinach and lettuces, etc., and how to save and store seeds from my favorite plants. Thanks to Dr. McBug (www.drmcbug.com) I learned that I was killing the beneficial insects (parasitic wasps) in the small white coccoons while killing the catterpillars (see previous post). 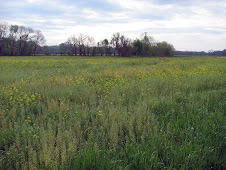 For more info about this and similar plant events visit http://www.heritageharvestfestival.com/ and www.monticello.org/chp/ . 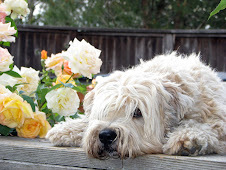 During the 30 yrs I spent in Northern California I never heard the expression “dog days of summer”. Now that I’m living in Virginia that expression pops up frequently in the media especially when our heat index last week reached 116 degrees Fahrenheit. The expression originated from the “Dog Star” Sirius which from July 3rd through August 11 rises with the sun. These days are often the hottest muggiest of summer. In our gardens during August, we need to respond to the heat and insects. When the temperature increases so does the water needs of our plants increase. Container planters and window boxes often need to be watered everyday. 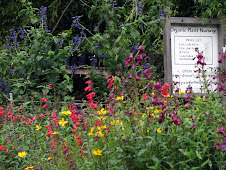 Garden and flower beds need twice weekly soakings unless they receive rain. Watering should be of sufficient quantity to soak deep into the ground which encourages deep roots. Frequent shallow watering discourages the development of deep roots. Deep roots protect the plant from drying out between watering. Organic mulch cools the soil and reduces water evaporation from the soil. During a long spell between rains, young trees and shrubs also need a long drink from your water hose. Insects rule in August. Pollinators, such as butterflies, bees, wasps, etc., are necessary for the development of fruits and nuts. Destructive insects such as Japanese beetles, chiggers, mosquitoes, and some caterpillars make our garden chores miserable. Early mornings I shake Japanese beetles off branches into a pail of soapy water. 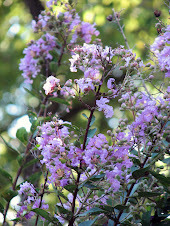 I only have one crepe myrtle, a favorite of Japanese beetles. I would need a ladder to reach all the branches, but killing just one mating pair of beetles can reduce the number of next season’s beetles. Yesterday I was picking small caterpillars (smashing the really tiny ones) from my miserably mulched kale and chard plants. I gathered about twenty caterpillars and their white cocoons, probably cross-striped cabbage worms, in my hand and carried them inside to flush them down the toilet. I keep forgetting to sprinkle organic insecticide powder on my vegetable garden. Partly, because I have to cross chigger covered grass to reach my garden. My vegetable garden needs improvement. But, my zinnias, butterfly bushes, lavender, lantana, and cleome (all which are thankfully deer proof) are blooming profusely and supporting masses of butterflies. Recommendations: “CalaGel” lotion, http://www.teclabsinc.com/products or http://www.warmers.com/ , will quickly relieve the itch and swelling of chigger and mosquito bites and poison oak and ivy rash. Place biological “MosquitoDunks” in all standing water to kill mosquito larvae. For the cabbage looper caterpillar spray or dust. 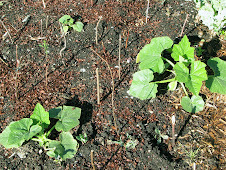 Safe products to reduce mosquitoes and cabbage looper caterpillars can be ordered at http://www.arbico-organics.com/ . Saturday morning found me at the Goochland Rural Market to buy fresh local produce (usually organic) which I have yet to grow. 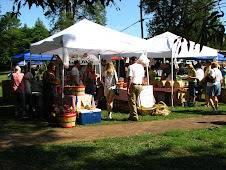 For guides to farmers markets and pick-your-own farms in Virginia visit http://www.virginiagrown.com/ . For farmers markets in other states visit www.ams.usda.gov/farmersmarkets/map.htm . "A Garden by the Sea"
If you are lucky enough to have a cottage by the sea; then please buy Leila Hadley’s book “A Garden by the Sea”. She and her husband, Henry Luce, planned and planted lovely organic flower gardens around their summer home on Fishers Island in Long Island Sound. This informative and readable book offers guidance for garden lovers who want to plant near the sea. Every summer I spend about two weeks a year on Fishers Island. 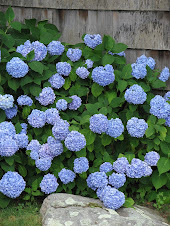 The Hydrangea macrophylla with blue bloom clusters the size of baseballs grace every yard. Marsh mallow shrubs with pink flowers line the brackish ponds and the coastline. 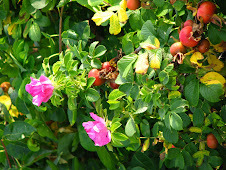 My favorite shrub is the rosa rugosa with white, pink or magenta flowers. Today after kayaking friends and I picked a few rosehips as we walked up from the beach. The fleshy part of rose hips can be eaten or throw into boiling water for tea. This fruit of the rosa is tasty and an excellent source of vitamin C.
While walking along the coastline nothing is better than juicy blackberries plucked from their vines and popped into your mouth. July brings hot humid days. Flower boxes, containers, vegetable gardens and the newly planted should be watered frequently. Even your compost may need watering. Fertilize your tomatoes. After harvesting the last raspberry cut back the smaller canes to the soil line; leaving the stronger canes for next season. 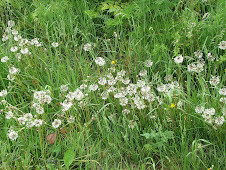 Pull your weeds before they go to seed. In 2007, people are planting a garden to commemorate the 400th anniversary of Jamestown, the first permanent settlement in the Americas. Individuals, garden clubs, plant nurseries, parks and businesses are participating with a red, white and blue theme. From containers and hanging baskets to large gardens these anniversary designs are appearing throughout Virginia. Enter your type of garden in the 2007 contest. The deadline is Sept 1st. 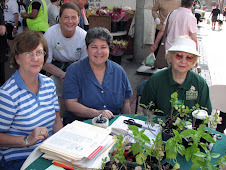 For more info on contest details and planting info please visit http://www.ext.vt.edu/americasgarden . Click on the link for help with your garden design and for informative lists of appropriate plants. 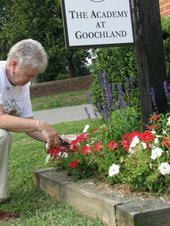 Elaine, member of the Goochland Garden Club, is deadheading blooms in one of the corridor gardens which the Garden Club planted along Rt.6 near the Goochland Court House. 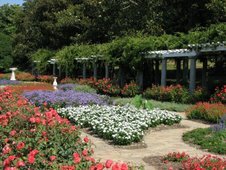 White petunias and blue salvia are surrounded by red roses in The Italian Garden at Maymont Park, http://www.Maymont.org, in Richmond. The wisteria blossoms are beginning to appear. The background is framed with blooming magnolias. Red, white and blue flowers line the walkway of the Jamestown Settlement’s visitor center and galleries. Click http://www.historyisfun.org for info, events, etc. 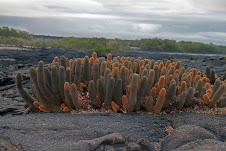 The first colonist realized the importance of plants and included a botanist, Johannes Fleisher, as a passenger in the first voyage to the New World in May 13, 1607. His job role was to record "exotic" plants and trees and to search for new botanical medicines. With the soaring temps to high 90s last week and hard rain from a tropical storm, early June reminded us that summer is upon us and that the hurricane season has begun. The summer solstice, the longest day in the Northern Hemisphere when the sun is directly overhead at noon, arrives June 21st. Cool mornings are perfect for continuing garden preparation. Container grown shrubs can still be planted, but water frequently. Scatter seeds of forget-me-nots in damp shady places. 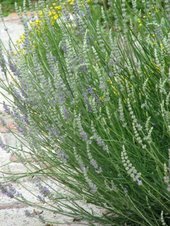 Perennials can still be planted, but for several days must be watered and protected form the hot sun. For autumn blooms, plant dahlias, mums, and salvias. Plant tropical water lilies in ponds and in water gardens. Start Brussels sprouts transplants. If we have less than one inch of rain in a week; water your plants. Irises and daffodils were lovely this spring. 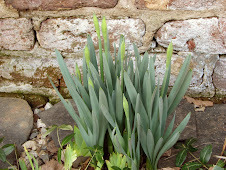 Bearded irises can be divided anytime from now until September. 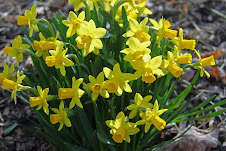 If large clumps of daffodils did not produce many blooms; they probably need to be divided. Slugs and snails are preying on your vegetables - especially my chard! Slugs and snails can be beneficial because they feed on crop pest such as caterpillars and aphids. 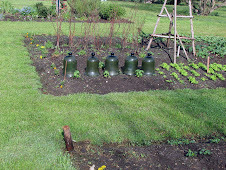 However, in small veggie and herb gardens they will eat seedlings, roots, tubers and young plants. 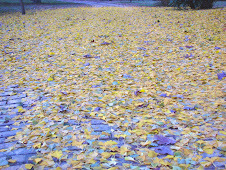 For prevention remove fallen leaves and thin plants in your garden. Bricks, wood and debris on the ground are good breeding areas and should be kept away from your plants. 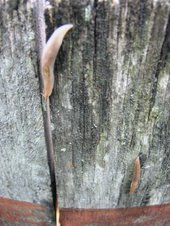 After heavy rains, go on a slug patrol to hand pick these pests. To trap and drown slugs, bury a container in the ground in a shady part of your garden. Fill with 1 to 2 inches of beer. Cut a 2 to 3 inch hole in the lid and cap the container. Replace beer as need. 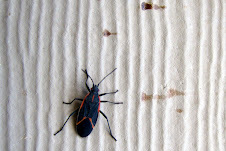 Place inverted containers, melon or grapefruit peels as shelters to attract these pest. Daily gather slugs and snails from the traps and place in soapy water of rubbing alcohol to kill them. Sand, wood ashes and baked eggshell pieces at the base of your plants will deter slugs and snails. Determine the texture and sweetness of vegetables by the time of day you harvest. Pick peas and corn late in the day for maximum sweetness. Lettuce, and other leafy veggies and cucumbers are crisper if picked early morning. Pick strawberries in early morn. Do not wash or stem the berries until ready to use and store in a covered container in the refrigerator. 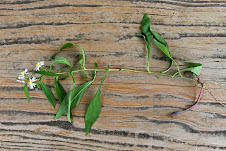 If harvesting herbs for essential oils; pick just before flowering on a sunny day. 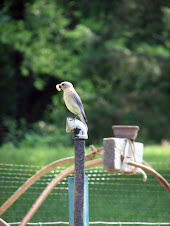 During spring and early summer parents introduce their young to my bird feeder. 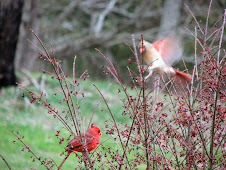 Families of goldfinches, cardinals, and indigo buntings provide more color than T.V. I’ve enjoyed watching a woodpeckers remove the outer seed coating from the sunflower seed then place the naked seed in the months of the waiting young. 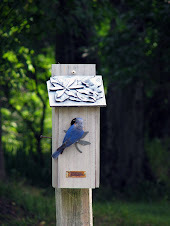 A pair of blue birds laid a new egg in their former bird house to begin a second family this season. The Blue Ridge Mountains are a bloom with wildflowers (false Solomon seal, foam flower, fire pink, mayapple, wild geranium, etc.). 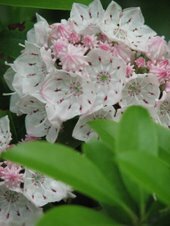 Rhodies(Rhododendron catawbiense) are peaking; azaleas are fading; Mountain Laurels are blooming. Bees have been making the headlines. Sadly, the news is not sweet. 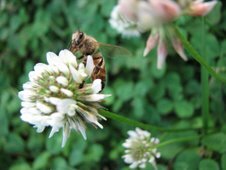 An April 23rd article in The New York Times reported on the decline of honeybees from 27 states, Europe, Guatemala and Brazil. Between September and March in the United States 26 percent of beekeepers had lost half of their bee colonies. This accounts for tens of billion of bees in our country. Throughout the world there are instances of bees becoming disoriented and unable to find their way back to the hive. They then die of exposure. Scientists are concerned because honeybees are the major pollinators of fruits, vegetables, flowers and nuts. They are urgently studying bee genes, autopsying dead bees and chemically screening the plants that came in contact with the diseased bees. If you missed The New York Times article you may have read in Style Weekly (Richmond, Virginia) on March 14th the article by Joe Essid, who keeps his honeybees in Goochland. While the New York Times article was scientific; his article was personal. 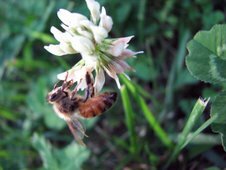 He pleads with us to let clover grow in our yards, to stop spraying poisons, to place hives in our yards, and buy locally produced honey. About two days ago at a meeting in Maryland the bee disappearance was given the name Colony Collapse Disorder (CCD). CCD only affects the European honeybee (apis mellifera). Questionnaires have been sent to beekeepers and scientists are still searching for the cause. The same day an NPR interview reported that 1/3 of American diet, which represents 14 billion dollars a year, is dependent on pollination by the European honeybee. The report ended with the concern that bees have the same role as canaries in a coal mine, by warning us of the dangerous loss of quality in our environment. Too soon spring will be over and summer heat and insects will be upon us. So use the cool days of May for weeding. And please protect the honeybees. Sat. night I returned from a conference in Arkansas where I interviewed Steven Foster on his new book, “Desk Reference to Nature’s Medicine” which is published by National Geographic. I had talked with him 12 years ago when I was harvesting ginkgo leaves for an herb company. Steven, who specializes in medicinal and aromatic plants, has become world renowned as an herbalist, lecturer, international consultant and botanical photographer. 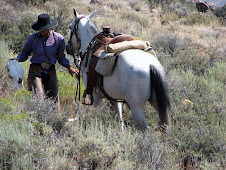 His website at http://www.stevenfoster.com is full of information on herbs and his international projects. April is a good time to divide and plant your fall potted chrysanthemums, which hopefully spent the winter in a protected location. Pinch off the tops down to 6 inches. Pinch every month to keep the plants at this height until late July. 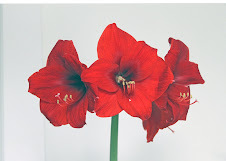 For a constant supply of cut flowers, plant your favorites at about 2 week intervals until mid July. April 26th is John James Audubon’s birthday. In celebration pull out and clean your hummingbird feeders. Also the hummingbirds will appreciate the planting of red or orange flowers, such as beebalm(Monarda). Since I replaced one of my gutters last fall and never disposed of the old one; I plan to attach the old gutter to an outside porch railing. Then I will add soil, seeds and small plants to the gutter. This will let me grow small flowers and vegetables out of reach (hopefully) of deer, groundhogs, and rabbits. If I’m real ambitious; I will install a cheap drip irrigation system along the inside of the gutter. 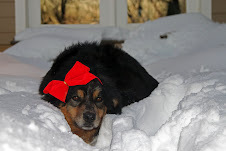 I’m dreaming of impatiens, begonias and pansies this summer which won’t be gobbled up. Sat. night I returned from a 2 week trip in Shanghai, China. 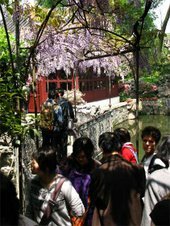 While there I visited the Shanghai Botanical Gardens which was packed with visiting Chinese school groups and Asian tourists. 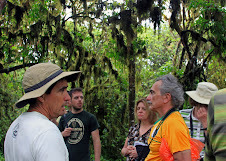 The 200 acres include enormous green houses displaying tropical and succulent plant environments. The Garden had many outdoor areas. 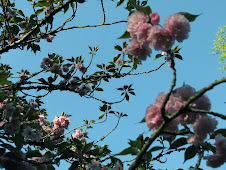 I visited the grove of different species of magnolia trees, a section with masses of blooming Azaleas planted along a creek, a collection of blooming peonies, and a pensive medicinal garden. There were ponds and a river. Other sections featured roses, bamboo, maples, camillias, and osmanthus. 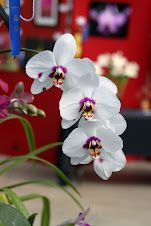 Their collection of orchids is considered the best in China. There is a Bonsai Garden with 100s of bonsai. I needed days to view the entire Botanical Garden. 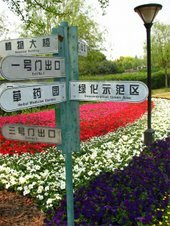 But the next day I traveled to the town of Suzhou, which is often called the “Garden City” of China. This ancient city was built 2,500 years ago and is famous for its classical gardens and is considered one of the earliest birthplaces of Bonsai art. 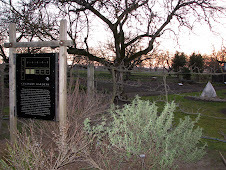 Of the sixty gardens several are listed as a UNESCO World Heritage site. One of these which I visited the Humble Adminstrator’s Garden is the largest at 12.85 acres and considered one of China’s four most famous gardens. Chinese garden landscapes consider rocks and water as important as the plants. The gardens interact with the wandering rooms of the home. Windows are placed to frame a view of an organic weird rock, a graceful tree, or blooming flower. 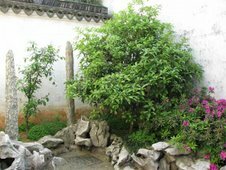 Even in a small garden, such as The Master of the Nets Garden, the inner garden of 660 square feet contains a pond surrounded by a covered walkway, a small bridge, and pavilions and is decorated with trees, flowers and rocks. I saw a blooming wisteria which flowed over the roof and was supported by its ancient 2 foot in diameter mangled and twisted trunk. About 4 weeks before the last frost is the time to plant dormant roses and bare-root shrubs. 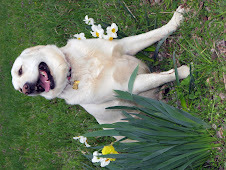 Dogwoods and magnolias should only be planted in the spring. A young tree will develop a stronger trunk if the tree is not tightly staked, but allowed to sway with the wind. 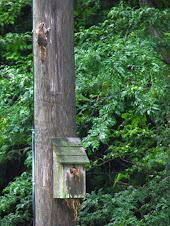 To quicken the decay of tree stumps cover the stump with soil. 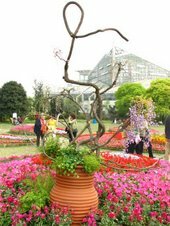 Tree stumps may be used as an attractive base for flower pots. Or plant flowers in the rotten areas. This is a good time to repot houseplants into larger containers. Leggy plants should be cut back. Root your cuttings to grow additional plants. The secret to rooting coleus and wax begonias is to cut the top 6 inches of a leafy stem below a leaf node. Then remove the leaves from the bottom 3 inches and place the cutting in water adding a few drops of bleach. Place in a partially sunny window. Place in soil after roots have developed. Perennials such as hostas, liriope, daylilies, Shasta daisies, astilbe, and coral bells can be divided before new growth starts. Plant the extras in containers for gifts. Fertilize lilies, clematis, lilacs and bearded iris with bone meal or 5-10-5 plus lime. Also fertilize pansies and houseplants. Do not begin fertilizing peonies until after they have been planted for 2 to 3 years. A great all around fertilizer is liquid seaweed. Vegetables that can be planted before the last frost are lettuce, cabbage, broccoli and Brussels sprouts. Also plant seeds of carrots, beets, radishes, and parsnips. Plant onions, potatoes, peas, radishes, asparagus, and turnips near the end of the month. Seedlings started inside will appreciate fertilizing at half strength every two weeks. Add mulch to asparagus, artichokes, bramble fruits and fruit trees. Don’t remove mulch from your other plants. The ides of March can bring surprises such as our 80o week followed by two frosts. For two nights an opossum has met me at my door. The pests are appearing. If you use wire fencing around your vegetable garden; let the wire have some slack between posts. 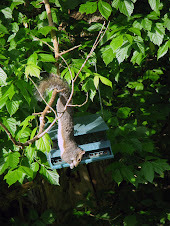 This makes it more difficult for groundhogs to climb your fence. 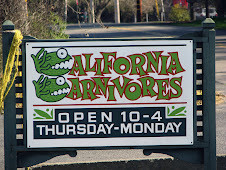 However, I found out that opossums are not a pest, but eat insects, such as cockroaches, crickets, and beetles. They catch and eat rats, mice, and they consume dead animals. They like over-ripe fruit, berries, and grapes. They think snails and slugs are scrumptious! Opossums are North America's only marsupial; since they carry their young in their pouch. To learn more for $25 a year you can join the National Opossum Society (www.opossum.org).